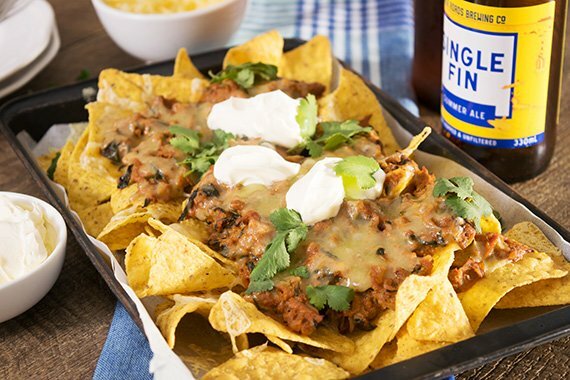 These vegetarian nachos are a little sneaky - replacing the beef mince with walnuts is a surprising yet delicious move. Packed full of goodness, topped with melted cheese and sour cream, it is sure to please the whole family. (Tip: for the veggie smugglers out there - if you want to make the veg almost undetectable, you can blitz it in a food processor to hide it from those harsh mini critics of the family). Share your triumph on Instagram #youplateit- Enjoy! Preheat oven to 200°C. Wash the fresh produce. Peel and medium dice half the onion (you will have remainder). Cut zucchini in half length ways, remove seeds and grate on a box grater. Roughly chop tomato. Pick coriander leaves, discarding stems. Roughly chop spinach leaves (optional for those who prefer to hide their spinach). Place onion and walnuts in a food processor and pulse to a rough consistency (Tip: be sure not to over process, or it will become a paste). Alternatively, you can roughly chop the walnuts. Add 2 tsp oil to a pot over medium-high heat. Add nut mince, spices, soy sauce and tomato paste. Cook for 2-3 minutes. Add zucchini, chopped tomato, a big handful of spinach (to taste) and ½ cup of water. Bring to a boil, then reduce the heat to a simmer for 8-10 minutes, until liquid has slightly reduced. Spread corn chips over a lined baking tray, add nut mince and top with grated cheese. Place in the oven for 5 minutes to melt the cheese. Carefully remove from the oven and top with a dollop or two of sour cream and coriander leaves. Enjoy!